Gardener's Cottage is the smallest of our wholly detached holiday cottages. Situated close to, but fully separated from, the Main House, in the old days it contained the lamp room for the house. The maids' sitting room was to be found where the present sitting room is. Upstairs were the trunk room, for the suitcases the Summers used when travelling abroad and a servant's bedroom, according to some used by the Estate Gardener, hence the name of the cottage. Its proximity to the main house does not impinge on its privacy. On the contrary, it is the most privately situated of all our cottages, being well away from the drive, any cars and/or people passing, and with its private patio. Gardener's Cottage is approached down an old outside natural stone staircase, as can be seen in one of the photographs above. 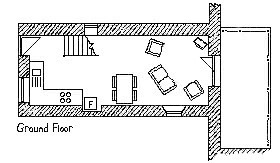 From the kitchen end of the open plan sitting room an open-tread pine staircase first passes an intriguing little window looking down into the greenhouse and then ends in a little hallway, from which two bedrooms lead off: one contains a double bed and the other a single. The cottage thus sleeps three. Gardener's Cottage has a top-of-the-range bathroom, with a very spacious shower, but no bath. At the back of the cottage - clad in slate - there is a spacious private patio - a veritable sun trap. The kitchen is finished to our standard high grade, and has a dishwasher. Living room and kitchen have slate floors with underfloor heating. Contrary to what one might expect, they are very light and airy, with windows on three sides.
" We've had a fantastic time here at Rosemoor. The cottage has been lovely and the children have very much enjoyed the 'park'! " " Thank you very much for a lovely clean cottage. We had a lovely holiday. "